The “new studio album, ‘Firepower,’ will be arriving in early 2018,” shared the band across their social media sites. The 7-week opening leg of Judas Priest’s 2018 world tour – with guests Saxon and Black Star Riders – will begin in Wilkes Barre, PA on March 13 and wrap up in San Antonio, TX on May 1. 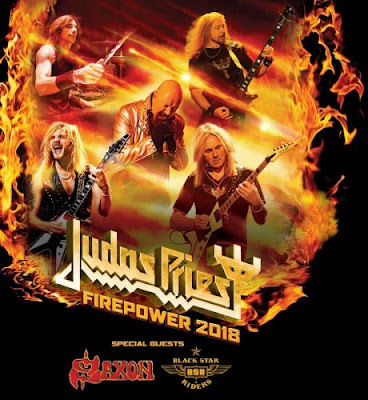 All dates will be running a Judas Priest Fan Presale starting Wednesday, October 25 at 10 AM local time with the password: FIREPOWER that fans can use to purchase tickets in advance. Check with your local venue for additional information regarding general public ticket sales. Judas Priest are among the nominees currently under consideration for induction into the 2018 Rock And Roll Hall Of Fame. Fans can vote for their favorite nominees from now to December 5 at rockhall.com as part of creating a “fan’s ballot” for Rock Hall voting members. The 2018 Rock And Roll Hall Of Fame inductees will be announced in December and the ceremony will take place at the Public Auditorium in Cleveland, OH on April 14.